Posted on 3, May 2016 by EuropaWire PR Editors | This entry was posted in Food & Beverage, Norway, Retail and tagged Arve Heltne, Grandiosa Fullgod pizza, Orkla. Bookmark the permalink. OSLO, 03-May-2016 — /EuropaWire/ — Several exciting new products from Orkla will be hitting Norwegian store shelves in May. A multitude of new products are now on their way to grocery stores. This will give you a taste of some of the new offerings from Orkla’s Norwegian companies. “The wave of May product launches features a focus on healthiness and naturalness. Bixit oat bar with quinoa and raspberries and Panda Natural liquorice with all-natural ingredients are examples of this emphasis,” says Arve Heltne, Senior Vice President Orkla Marketing & Innovation. 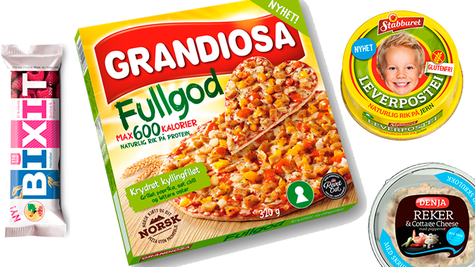 The new pizza from Grandiosa bears the Nordic Keyhole healthy food label, has a thin, crisp whole-grain crust and contains a maximum of 600 kcal. The Denja Våre Beste range of sandwich toppings offers more of the wholesome ingredients, and two thirds of the mayonnaise has been replaced with cottage cheese. “We are proud to be able to expand our gluten-free product range with two varieties of the popular favourite Stabburet Leverpostei paté. Our aim is to make daily life easier for families with children and other consumers who have an allergy or intolerance to gluten or milk,” Arve Helte says. Ballerinakjeks biscuits are being relaunched without palm oil but with the same good taste. Other tempting new products include TORO Bakemiks Eplekake apple cake mix, Big One Taco Real pizza and Crispo og Smørbukk Bites confectionery, which is already a success in Sweden under the Ballerina brand. New Energy is launching a new muesli bar with oats and cranberries. “We have revamped the design of several of our personal care products. Solidox by Jordan, where you can choose both the toothpaste and toothbrush design, and the LdB and L300 skin care ranges are examples of this innovative approach,” Arve Heltne explains. Nutrilett is introducing a new design for its entire product range with focus on naturalness and taste. Pierre Robert Sport is expanding its range with a new tank top tailored for movement.